Phases can compete with the best of Angel Olsen's work, but you might have to sift through some clutter to find its gems. B-side collections aren't typically something to get too excited about, but an exception can be made for Angel Olsen. Olsen's terrific 2016 release, My Woman, was monumental in sound, yet deeply personal, traversing all the way through the epic heights of "Sister" to the crushing despair of "Pops". With the wonderful music she's gifted us with so far, Olsen has more than earned our attention, no matter what she decides to release. 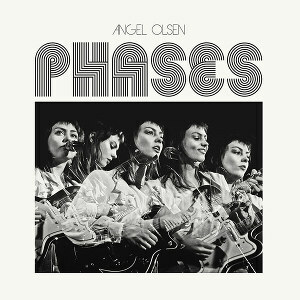 Olsen's 2017 release, Phases, is an album made up of B-sides, covers, and home recordings. Considering the release dates of Phases and My Woman fall about a year apart, you'd be excused for thinking Phases was going to be a continuation of the album that preceded it. Gone though are the sprawling rock pieces that characterized My Woman and 2014's similarly excellent Burn Your Fire for No Witness. Phases, a stripped-down affair, fits in more with the folksy sonic palette of Olsen's Half Way Home from 2012. The album kicks off with "Fly on Your Wall" and "Special", two exciting, though potentially misleading opening numbers. Neither song, with their impressive guitar work and grandiose finales, would seem out of place on either of Olsen's recent releases. By the third song though, the album undergoes a noticeable shift, eschewing the rock stylings of the first two pieces and replacing them with lo-fi, folk recordings. Sadly, this is also the point where the album seems to slightly fall apart. Phases has a potent problem with pacing. When the two most engaging songs on the album are placed at the beginning, the rest of the album can comparatively feel like a chore to get through. Many songs past this point feature Olsen softly singing solo with intermittent guitar strums added in. With so little going on sonically, much rests on Olsen and her melodies. Olsen is up to the task, but I can't always say the same for the music which occasionally tends to be bland or monotonous. This isn't to say the music is terrible on the album. I've already spoken on the merit of the openers, and "Sweet Dreams" is a catchy number that shakes up the album's tone for a moment. The adjacent tracks "For You" and "How Many Disasters" form a particularly high point, featuring the strongest melodies on the album. They may not do much to challenge the threat of monotony, but the strength of the music more than excuses the continuity. Unfortunately, the final two songs that follow squash any advances the former songs made, featuring an even more extreme degree of sparseness that the somewhat mediocre melodies just can't justify. Though the music of Phases can be somewhat of a mixed bag, Olsen's thoughtful and impactful lyrics patch up a lot of the album's weaknesses. The sparse instrumentation allows us to focus directly on Olsen and her achingly personal musings. The most poignant example of which is "How Many Disasters" where Olsen masterfully portrays a love that's impossible to shake. Every line is worth hearing, and the thin veil of music certainly enables us to do so, if nothing else. For fans of Half Way Home, Phases might be a welcome reminder that Olsen still has her lo-fi sensibilities intact. Fans who flocked to Olsen in the last couple years though won't find a lot to hold their attention, especially when listening to the album front to back. Despite this, there are gems galore to be found on the album, some of which could go head-to-head with the best of Olsen's work. Unlike Olsen's past releases though, you just might have to sift through a fair amount of clutter to find them.